Nets open 08-14.30. Netmeter hours ca. 1700. Sunny, light shifting breeze. Playback on Green Sandpiper. Ringed: Green Sandpiper 1, Meadow Pipit 1, Northern Wheatear 1, Common Blackbird 1, Sedge Warbler 1, Common Whitethroat 1, Willow Warbler 8, Chiffchaff 3, Common Starling 1, House Sparrow 2, Chaffinch 3, European Goldfinch 1, Commoin Linnet 1, Yellowhammer 1. Total = 26. 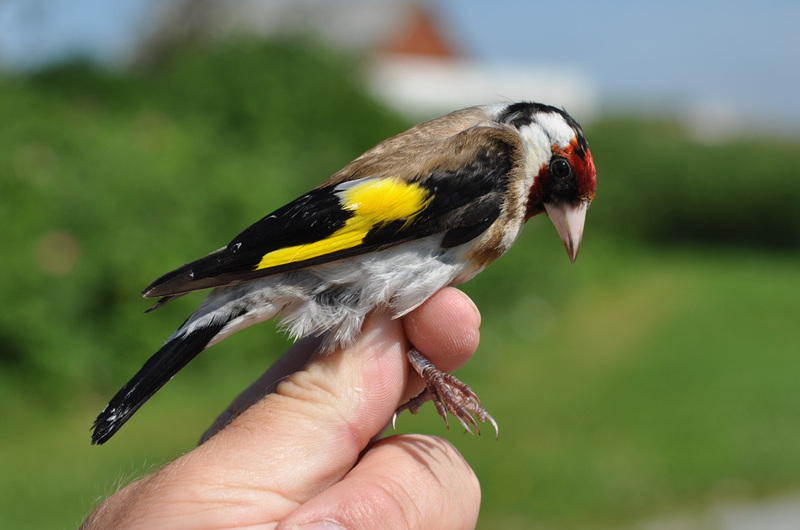 European Goldfinch, 2cy+ female. Stillits, 2K+ hunn.